Martin Truex Jr. won the pole for Saturday’s NASCAR Cup Series race at Kentucky Speedway on Friday. 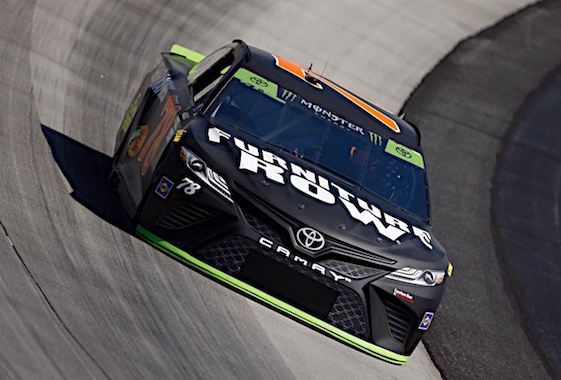 “It wasn’t a perfect lap by any means but it was good enough,” said Truex after posting a speed of 188.890 mph (25.588-seconds). “We worked in race trim the whole time and honestly, our qualifying run, we only got one in during practice and it wasn’t very good. We hit traffic. Saturday night’s first-time winner Erik Jones was second, followed by Kevin Harvick, Brad Keselowski, Kyle Busch and Paul Menard. Ryan Blaney, Clint Bowyer, Kurt Busch, Ryan Newman, Daniel Suarez and Aric Almirola completed the top 12 in time trials. (78) Martin Truex Jr., Toyota, 188.890 mph. (20) Erik Jones, Toyota, 188.739 mph. (4) Kevin Harvick, Ford, 188.547 mph. (2) Brad Keselowski, Ford, 188.390 mph. (18) Kyle Busch, Toyota, 188.206 mph. (21) Paul Menard, Ford, 188.121 mph. (12) Ryan Blaney, Ford, 187.944 mph. (14) Clint Bowyer, Ford, 187.696 mph. (41) Kurt Busch, Ford, 187.630 mph. (31) Ryan Newman, Chevrolet, 187.071 mph. (19) Daniel Suarez, Toyota, 187.000 mph. (10) Aric Almirola, Ford, 186.884 mph. (3) Austin Dillon, Chevrolet, 187.169 mph. (17) Ricky Stenhouse Jr., Ford, 187.071 mph. (88) Alex Bowman, Chevrolet, 186.625 mph. (9) Chase Elliott, Chevrolet, 186.548 mph. (6) Matt Kenseth, Ford, 186.522 mph. (42) Kyle Larson, Chevrolet, 186.342 mph. (22) Joey Logano, Ford, 186.329 mph. (37) Chris Buescher, Chevrolet, 186.181 mph. (24) William Byron #, Chevrolet, 186.143 mph. (1) Jamie McMurray, Chevrolet, 185.886 mph. (34) Michael McDowell, Ford, 185.465 mph. (38) David Ragan, Ford, 184.716 mph. (43) Bubba Wallace #, Chevrolet, 184.533 mph. (47) AJ Allmendinger, Chevrolet, 184.483 mph. (48) Jimmie Johnson, Chevrolet, 184.420 mph. (13) Ty Dillon, Chevrolet, 182.846 mph. (95) Kasey Kahne, Chevrolet, 182.543 mph. (15) Ross Chastain(i), Chevrolet, 181.178 mph. (72) Corey LaJoie, Chevrolet, 180.385 mph. (23) JJ Yeley(i), Toyota, 179.868 mph. (00) Landon Cassill, Chevrolet, 179.104 mph. (51) BJ McLeod(i), Chevrolet, 177.883 mph. (99) Garrett Smithley(i), Chevrolet, 176.188 mph. (11) Denny Hamlin, Toyota, 0.000 mph. (32) Matt DiBenedetto, Ford, 0.000 mph. (7) Jesse Little(i), Chevrolet, 0.000 mph. (66) Timmy Hill(i), Toyota, 0.000 mph.